Remember Bree Sharp, she of the “David Duchovny” song? Now I’m one of those who bought the A Cheap and Evil Girl CD back in the day and I liked it. I didn’t adore it, but I liked it. It was better than just the one hit song. Well, this is her project with Don DiLego (they call themselves, Lee Fever and Rocket Del Fuego, respectively) that make up Beautiful Small Machines. I don’t know much about her musical partner other than he worked on her previous album. But from that album I knew she was talented. They make a great team. They call their sound sci-fidelity, which I find endlessly charming. There’s a bit of an 80s electro feel, staccato rhythms and synths. I can picture Molly Ringwald in Breakfast Club dancing on the table to the song, Counting back to 1; which is a marvelously fun party song. 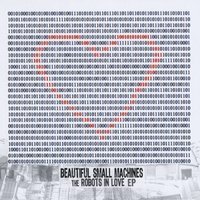 Robots in Love is so radio friendly I thought it was familiar the very first time I played it. That’s not to say it’s derivative, just comfy. This is a really fun little record. I was going to say I wish it was longer, just because I like it, but you know what? This is a good length. It’s different enough that maybe 12 songs in a row of it would be too much. But maybe not, I mean, the more I hear this record the more I like every song on it. I do find when one of these songs comes on in shuffle mode, I get a stupid happy grin on my face. David Duchovny why wont you love me? Ah, that’s what I kept asking myself too back in the day. Nice to see her back.